MILLERSBURG – A Millersburg bridal shop owner is making it a bit easier for military families to say “I do”. Wanda Latshaw, owner of Special Moments Bridal Boutique, will be hosting a Veterans’ Day Giveaway on Monday, Nov. 12, with 100 bridal gowns offered for free to military personnel or veterans. All that’s needed is valid military identification for the groom or bride. The service member can be from anywhere, she said. “They’re out there fighting on the front lines so I have the freedom to run a business and I appreciate that,” said Latshaw. Although Latshaw doesn’t currently have any family members serving, her son-in-law, Doug Reinert of Halifax, was a former Marine. Latshaw said she heard about a bridal shop in the Pittsburgh area that had done something similar to assist military families and that’s what prompted her to try the give-away event at her northern Dauphin County business. She first made the announcement during a bridal show in August at the Best Western Premier hotel in Harrisburg. The give away will run from 9 a.m. to 8 p.m. at the shop, located at 321 Market St., (Route 147) Millersburg. Patrons should easily be able to spot the store’s mauve-colored double doors at the front entrance. Top-of-the line brand wedding gowns are among those being given away. Some of the brand selections include Maggie Sottero, Mori Lee, Eden, Anjolique, Emerald Bridal, Joli and Casablanca. Katie Fetter, of Millersburg, who works at the shop, recently modeled one of the offerings from Sincerity Bridal, valued at $800. It featured a corset-style, laced up back and beading. Fetter, Wanda Latshaw, and Natalie Latshaw will be available on the day of the give away to assist those searching for that special dress. There will be 245 gowns to choose from in sizes 4 to 30. Latshaw’s planning on giving away 100 gowns on a first-come, first-served basis for that one day only. Style options vary, too, from strapless, halter, two-piece top and bottom ensembles, ball gowns, short-sleeve, and long-sleeve gowns to dresses with detachable trains. A variety of material choices will also be available. Shoppers can select dresses in satin, chiffon, tafetta and lace. Bright white’s not the only color option available for today’s brides, and Latshaw’s dress giveaway reflects that. Customers can find free gowns in diamond white, which is a bit softer white; to ivory; to white dresses with black, wine, or chocolate-colored sashes or accents. Besides the free dresses, Latshaw will also have wedding shoes reduced to $10 per pair, as well as discounts on veils, headpieces and other accessories the day of the giveaway. Latshaw does all custom alterations on-site. More details can be found at the shop’s Facebook page at SpecialMomentsBridal or by calling 717-692-3994. Latshaw said the dress giveaway information was also featured on WHTM, ABC Channel 27 News, Harrisburg; and tagged on websites for the Carlisle War College and Ft. Indiantown Gap. 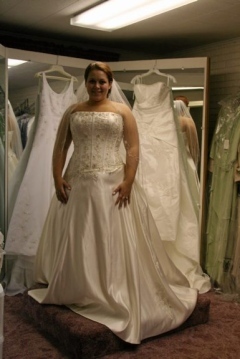 This entry was posted in Formal Dresses Australia and tagged lace wedding dresses 2012 on November 2, 2012 by persunau.